This document will guide you through the required steps to configure SMTP settings, which will allow the PhenixID server to use an external mail server to send emails. Access information about the external SMTP server: hostname, port number, username and password. This scenario will help you to configure settings that allows the PhenixID server to send email thought an external mail server. To view already available SMTP settings, click 'SMTP settings'. This will expand the list of already available settings, if any. 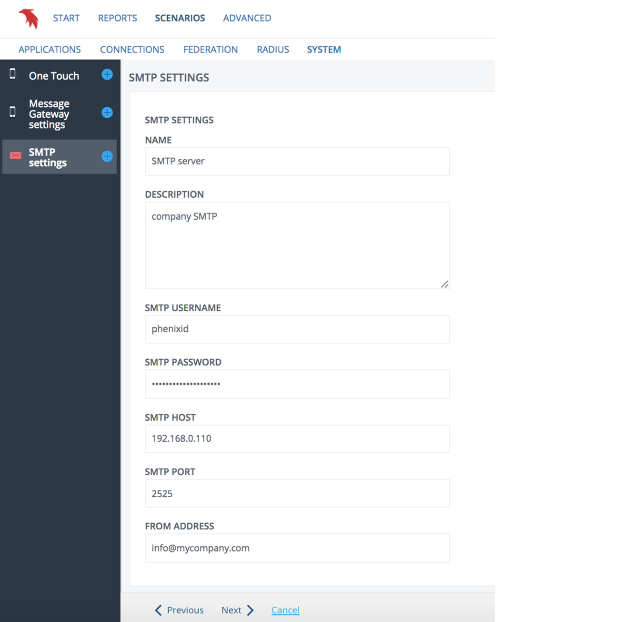 Add name and description of your own choosing for your new SMTP setting. Add values for SMTP server hostname, port number, username and password. Add a value for the 'From address'. This value will be shown in the 'from' field of all emails sent using this SMTP setting. Click 'Next'. You are now presented with a 'Summary' page, that displays the values that you have filled out in the previous step. If you are satisfied with the values, click 'Create', otherwise click 'Back' or 'Cancel'. Note: nothing will be created or updated until you click 'Create'. To edit or remove a SMTP setting, click on the setting that you wish to edit or remove. You are now presented with a SMTP settings form, with all current values filled in. When you are satisfied with all values, click 'Save'. If you want to delete the settings completely, click 'Delete'. You will be asked to confirm the action before the setting is deleted. Note: As soon as you click 'Save', the values presented in the form will be saved, and the previously saved values will be lost. If you want to revert to the last saved values, in the left hand bar click the name of the SMTP setting that you are editing. Any value that has not yet been saved will be lost.